The purpose of this post is to clearly delineate the distinct differences between strategy and tactics, and show how they work in tandem for your organization. Purpose To identify clear broader goals that advance the overall organization and organize resources. To utilize specific resources to achieve sub-goals that support the defined mission. Roles Individuals who influence resources in the organization. They understand how a set of tactics work together to achieve goals. Specific domain experts that maneuver limited resources into actions to achieve a set of goals. Accountability Held accountable to overall health of organization. Held accountable to specific resources assigned. Scope All the resources within the organizations, as well as broader market conditions including competitors, customers, and economy. Yet don’t over think it, to paraphrase my business partner Charlene Li, “Strategy is often what you don’t do”. A subset of resources used in a plan or process. Tactics are often specific tactics with limited resources to achieve broader goals. Duration Long Term, changes infrequently. Shorter Term, flexible to specific market conditions. Methods Uses experience, research, analysis, thinking, then communication. Uses experiences, best practices, plans, processes, and teams. Outputs Produces clear organizational goals, plans, maps, guideposts, and key performance measurements. Produces clear deliverables and outputs using people, tools, time. These two must work in tandem, without it your organization cannot efficiently achieve goals. If you have strategy without tactics you have big thinkers and no action. If you have tactics without strategy, you have disorder. To quote my former business partner, Lora Cecere, she reminds me that organizations need big wings (strategic thinking) and feet (capability to achieve). Strategy: Be the market share leader in terms of sales in the mid-market in our industry. Tactics: Offer lower cost solutions than enterprise competitors without sacrificing white-glove service for first 3 years of customer contracts. Strategy: Maneuver our brand into top two consideration set of household decision makers. Tactics: Deploy a marketing campaign that leverages existing customer reviews and spurs them to conduct word of mouth with their peers in online and real world events. Strategy: Improve retention of top 10% of company performers. Tactics: Offer best in market compensation plan with benefits as well as sabbaticals to tenured top performers, source ideas from top talent. Strategy: Connect with customers while in our store and increase sales. Tactics: Offer location based mobile apps on top three platforms, and provide top 5 needed use cases based on customer desire and usage patterns. Strategy: Become a social utility that earth uses on an daily basis. Tactics: Offer a free global communication toolset that enables disparate personal interactions with your friends to monitor, share, and interact with. First, educate your staff and colleagues on the differences of terms and how they vary. Next, ensure that all tactics align to business strategy, and all strategies take into account tactics on how they will be achieved. Finally, cascade in all communication how strategy and tactics work in tandem, advancing how your organization can see the larger goals, and better utilize resources to achieve. That’s my take, but please expand the conversation with your perspective, in the comments below. 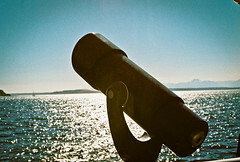 Image credit: “Telescope” by Kristin Marshall, used within creative commons licensing.